Number 14 Looking for a new home. 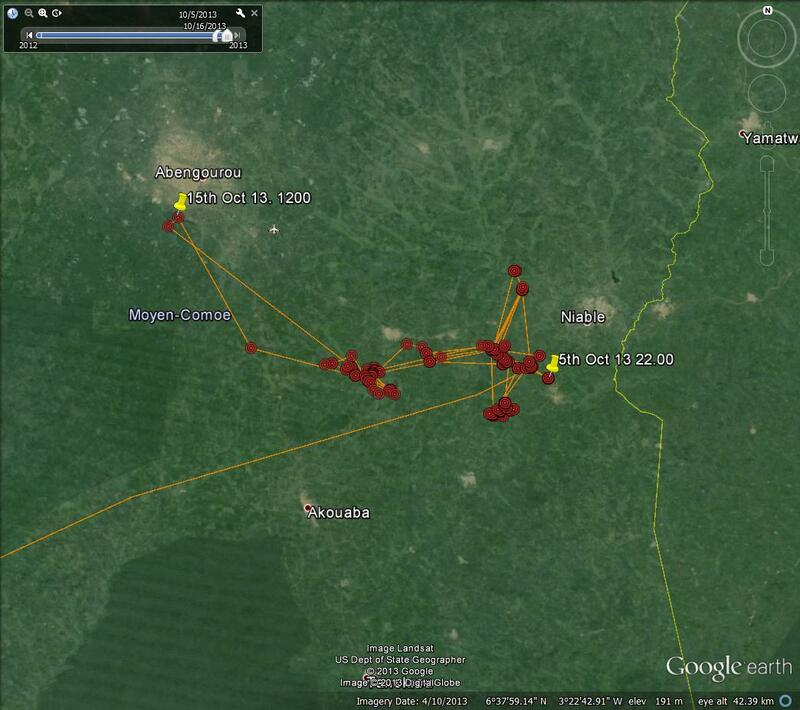 The migration season for our young ospreys of 2013 seems to have come to an end. For Number 15 it started on the 14th September when she flew south from Bassenthwaite and unfortunately finished in the Sahara Desert on the 4th October. For Number 14 it started a few days earlier on the 10th September and probably stopped somewhere around the 5th October over the Cote d’ ivoire. Our young male is now into another phase of his life, having survived the journey he is now into a more settled time looking for the best habitat he can find. He seems to have found an area that he can exist from, being between Abengourou and the border with Ghana, but seems still not totally satisfied. On the 19th October he had an overnight outing to the north east, a trip that took him into Ghana for a few hours on the 20th, but eventually brought him back to his original roosting sites mentioned above. He remained in that area again from the 20th until the 27th. After visiting the lake at Abengourou he has now gone on an expedition to the south west – could this be more successful? On the 28th he was roosting alongside the Komoe’ River, a river that is 759 km long and meets the sea at Abidjan and is famous for its riparian forests. Sharp eyed observers will note that he crossed this river on his journey east back on the 5th October hence the lower tracking line on our map. 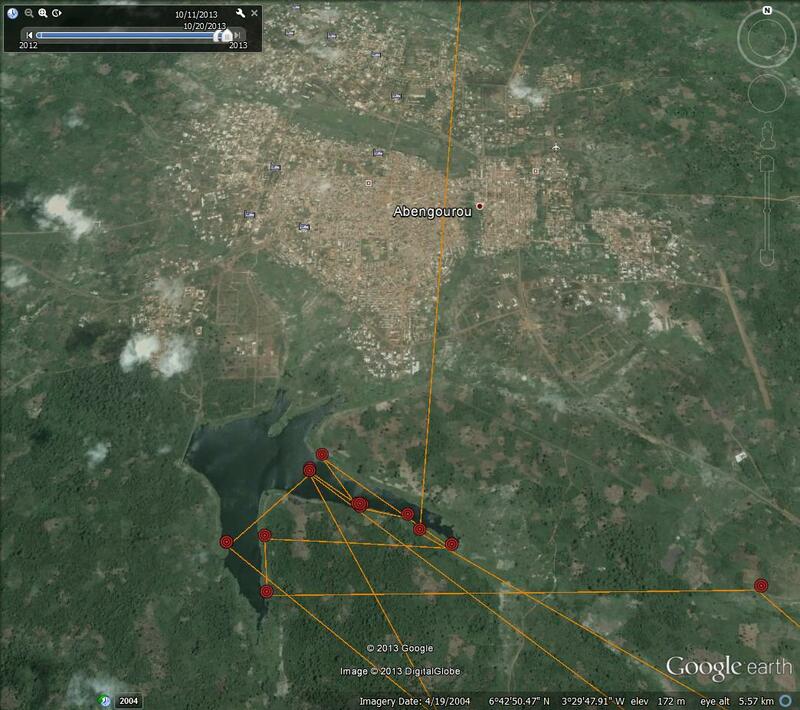 Number 14 has been in the Abengourou area of Cote D’Ivoire since the 4th October and seems to have discovered a nice lake just to the south of Abengourou itself – memories of the Lake District maybe? A lake that seems to be nameless as far as we can tell. Young Number 14 seems to have taken to the lake, presumably due to the fish in it, and made visits on the 15th, 16th, 17th and 19th of October, roosting close by on the 16th. On the 19th he decided to go on an outing to the north east and had a forty mile flight before finding a suitable place to stop for the night. Unlike the Lake District temperatures in the area are currently between twenty two and thirty seven degrees centigrade with negligible wind. Humidity ranges between 40% and 85%. 1mm of rain is forecast. Our young osprey Number 14 seems to making himself at home in the Cote de’ Ivoire. 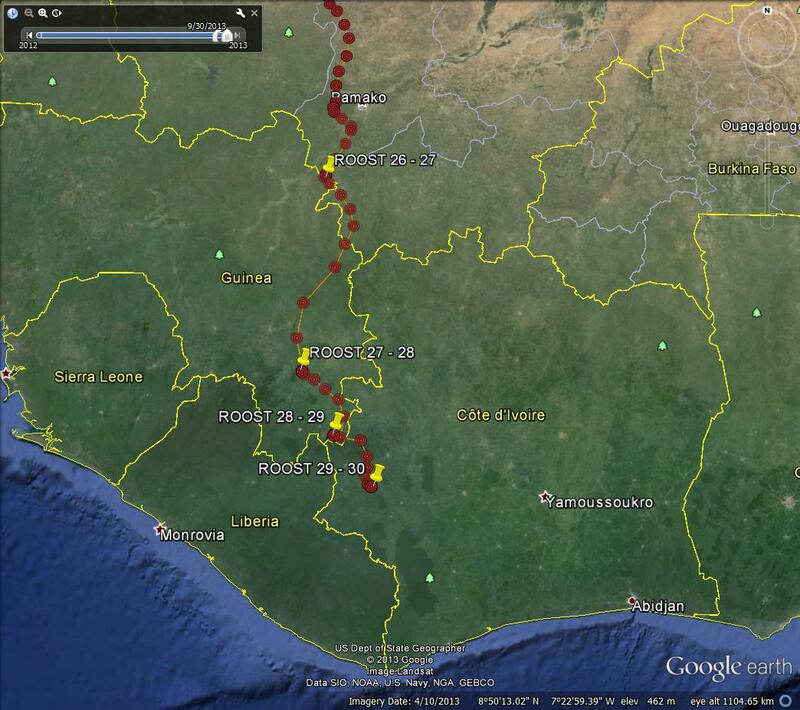 He has been exploring the land between Abengourou and the border with Ghana – maybe he has picked up our volunteers love of cocoa and coffee – He has even been logged at the large reservoir just to the south of Abengourou itself (15th). Number 15s Migration comes to an end. It is a sad day when we have to report the loss of an osprey. Unfortunately that is what we have to do today. Like no doubt many other creatures Number 15 simply did not survive the crossing of the Sahara Desert, one of the harshest climates on our planet. Since the Atlas Mountains and probably the last sight of water and fish she had travelled over a thousand miles with at least six desert roosting sites. 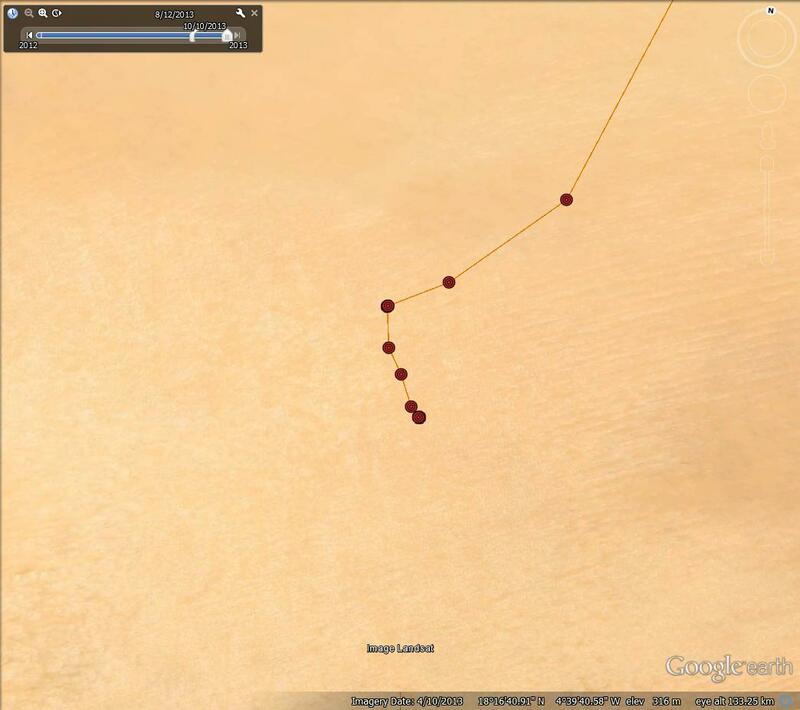 Her journey came to an end about mid-day on the 4th October in the desert of Northern Mali; her final position was Latitude (N) 18.17550, Longitude (E) -4.61150. The map below is approximately a square of one hundred miles and gives some indication of the remoteness of that region. 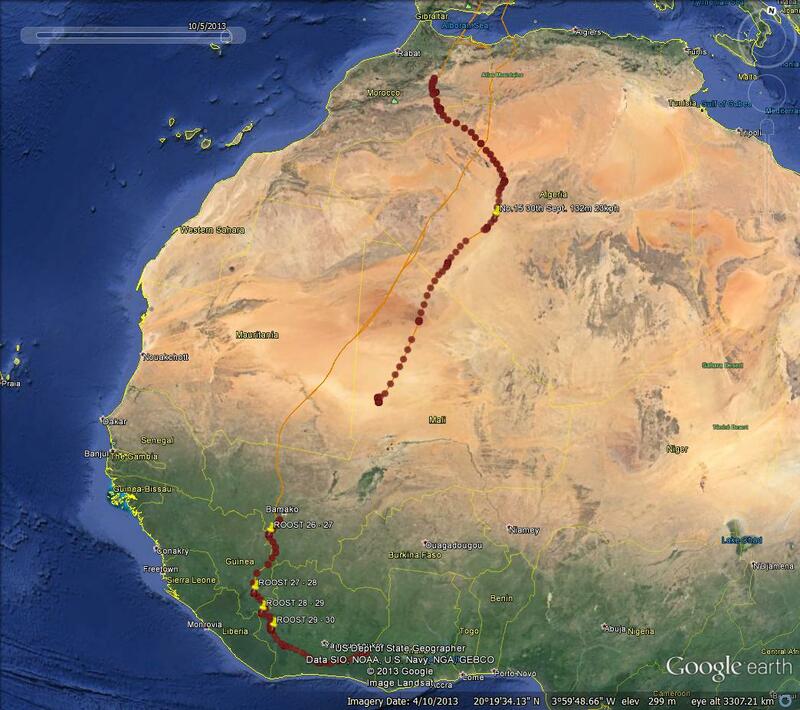 Maybe we should not be too surprised that we lose ospreys and indeed other birds to the Sahara Desert but should be surprised that any survive the journey at all. Number 14 is doing well and will be the subject of the next report. Lake District Ospreys continue to surprise. As of yesterday evening both our Ospreys were still on the move. Number 15 is still crossing the Sahara Desert but has now moved into northern Mali on a parallel track followed by her brother. 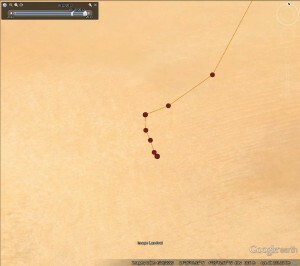 She however has now spent eight days in the desert following a low but steady course. 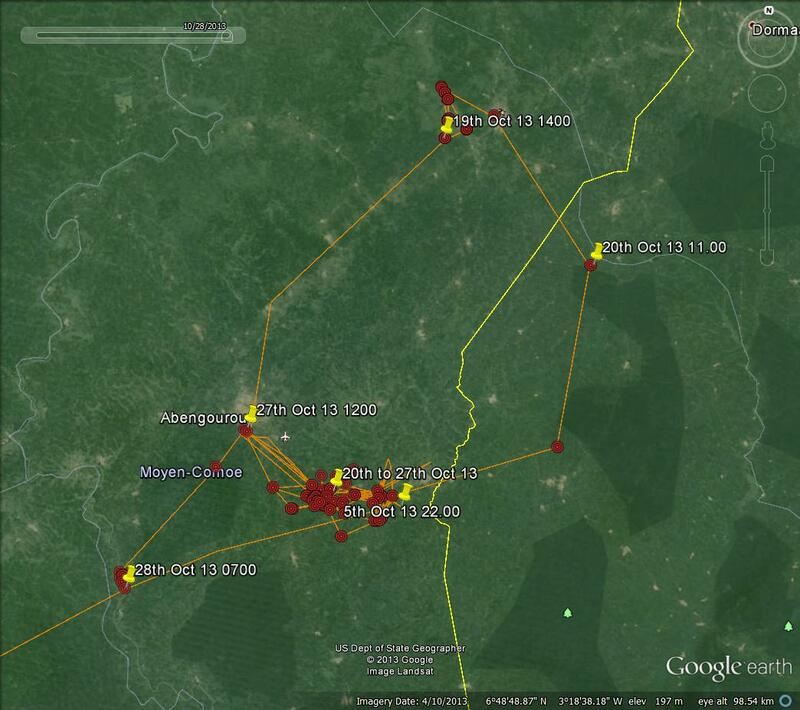 Number 14 from his roost on the 2nd October has moved steadily eastwards. 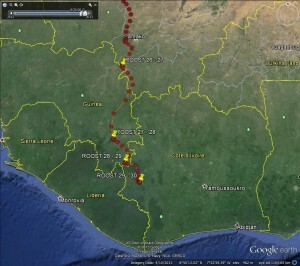 On the night of 4-5th October he roosted south-east of Yamoussoukro (capital city of Cote d’ Ivoire) but has since moved further east towards the border with Ghana. His last position was within five miles of that border. Lake District Ospreys ; Where are you going? 73 miles, 28 – 29th 60 miles. He seems to be using the same roost on the 30th as he used for the 29th. The question now is where will he go when he meets the coast? Extra points will be given if you can name the capital cities of Guinea and the Cote d’ Ivoire. Number 15 is also making her way south. On the evening of the 30th she was crossing the Sahara Desert. She was still just about in Algeria but following a similar course to her big brother. Unlike him she likes to keep slow and low. On the 21st at a nearby spot he was 2041m high travelling at 63kph, while she at last recording was 132m high travelling at 23kph.